Buffalo Computer Graphics, Inc. (BCG) is pleased to continue its excellence in the radar simulation arena with the PCS-300 Radar Simulator. This system allows the user to stimulate a real radar system with a fully controllable radar presentation while maintaining the operator controls of the radar. The PCS-300 offers this with a higher level of hardware integration and more emphasis on software generated radar imagery than its predecessors. The heart of the PCS-300 is BCG's Radar Signal Generator Board (RSG). 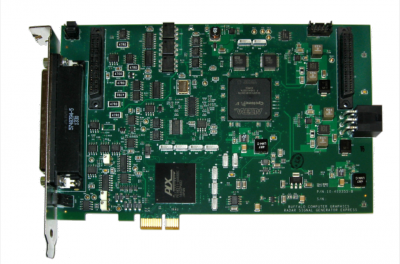 This single slot PCI-Express format module allows BCG more flexibility for packaging the PCS-300, such as a 1U rack mount chassis or a small portable unit. The reduced parts count of the PCS-300 increases system reliability while reducing the cost of maintenance spares. The PCS-300 delivers a stimulated radar presentation for a wide variety of radar displays with accuracy, realism and an impressive price / performance ratio. The list of available radar interfaces is below. However, we can create new interfaces with certain information, please contact us with your requirements. The PCS-300 Radar Simulator merges BCG's 30+ years of radar simulation and modeling capabilities with high speed FPGA technology, to produce a realistic radar presentation on real radar displays. Features such as 4-yard resolution, large exercise areas, target ship shape, enhanced radar effects, true 3D modelling, and full programmability are now available in a low cost simulation platform. The PCS-300 utilizes the latest PC technology as its foundation. The simulated Ownship is controlled by the operator at our Maritime Simulation Tool (MaST) workstation. For multiple Ownship configurations, several simulators may be networked together and controlled from a single workstation. Each Ownship acts as an independent radar platform in the simulator network. The instructor's MaST workstation may even be located remotely from the PCS-300 unit(s). For bridge visual systems, the PCS-300 is programmed and controlled through a single Ethernet connection.